The Bigelow Expandable Activity Module, an inflatable space room built by Bigelow Aerospace, is moved by robotic arm to its new home on the International Space Station on April 16, 2016 in this exterior camera view. BEAM is a prototype for future space habitats. 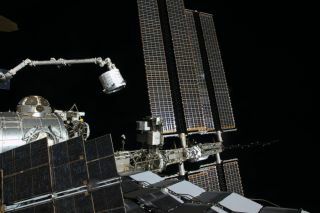 The International Space Station gained a brand new room on Saturday (April 16), but it will be another month before it grows large enough for the astronauts to enter. A first-of-its-type inflatable structure, the BEAM — or Bigelow Expandable Activity Module — built by Bigelow Aerospace, was attached to the rear-facing port of the space station's Tranquility node. It is the first new addition to the orbiting outpost in five years. Early Saturday, flight controllers at NASA's Mission Control in Houston began sending commands to the space station's Canadarm2 robotic arm to extract the deflated, compressed BEAM from the Dragon and move it into position next to its attach point on the Tranquility module. Astronauts Tim Kopra and Jeff Williams then secured the BEAM from on board the station using the complex's common berthing mechanism controls. By 6:12 a.m. EDT (1012 GMT), the space station had its first privately built room. "We're about to have another module on @Space_Station," NASA astronaut Tim Kopra wrote on Twitter during the move. "Arm attaching inflatable module #BEAM to the Node 3 aft port." BEAM, which was compacted for its launch to a size of just 7 feet (2.1 meters) in diameter and 8 feet (2.4 m) in length, will be expanded to nearly five times its size at the end of May. The space station's air supply will be used to inflate the new room to its fully-formed shape and then the BEAM's own air tanks will pressurize the module on or around May 26. "We want to understand the structural integrity, the radiation performance of [the BEAM] and the temperature controls in order to help inform our choices for deep space habitats," said Jason Crusan, director of NASA's Advanced Exploration Systems Division, in a press conference prior to the module's launch. Robert Bigelow, the president of Bigelow Aerospace and owner of the Budget Suites of America hotel chain, said that BEAM might also eventually be used to support commercial projects. BEAM is made of multiple layers of a proprietary, Vectran-like soft material. Once expanded and pressurized, the habitat will be as tough as the more traditional solid body modules that form the space station's other rooms. Once the two-year test period is over, BEAM will be jettisoned from the space station to burn up during its descent through Earth's atmosphere. Bigelow Aerospace and United Launch Alliance (ULA) recently announced a new partnership to develop a much larger expandable space habitat as a follow-on to BEAM. It is slated to launch it in 2020 on board a ULA Atlas V rocket. The future expandable module, which will feature an internal volume of 12,000 cubic feet (330 cubic meters), or about 30 percent of the International Space Station's volume, will be capable of being a self-sufficient orbiting outpost, but might first be attached to the station, similar to how BEAM was on Saturday. An artist's illustration of the Bigelow Expandable Activity Module (BEAM), built by Bigelow Aerospace, inflated and attached to the International Space Station. "We are exploring options for the location of the initial B330, including discussions with NASA on the possibility of attaching it to the International Space Station," said Bigelow in a statement. "The working name for this module is XBASE or Expandable Bigelow Advanced Station Enhancement." Robert Pearlman is a contributing writer and the editor of collectSPACE.com, a Space.com partner site and the leading space history news publication. Follow collectSPACE on Facebookand on Twitter at @collectSPACE. Follow us @Spacedotcom, Facebook and Google+. Original article on Space.com.